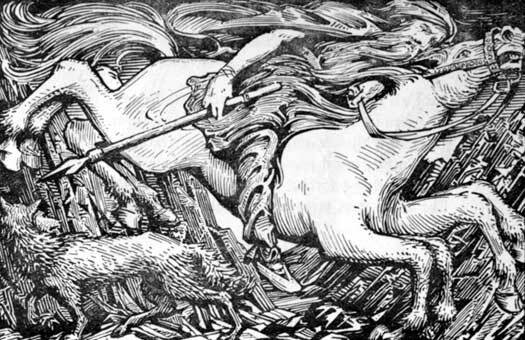 There has always been something a little odd about the Norse and/or German god called Odin, O∂inn, Wodan or Wotan. For one thing his name was not a personification of some natural or supernatural force. For another, Norse tales about him describe a magician, not a god. Normally this might invite curiosity and investigation, but this time an analysis from another direction also led very inevitably to him. It's easy to be fascinated by names and their meanings, and the current author is no exception. Names and words in general change over time. When analysing Celtic names, there were several times when a hard 'g' or hard 'k' sound has been encountered where older or related forms of the same name had a 'w' sound. The first example was 'coed' or 'goed' in Welsh, which means a forest. In English the cognate is 'wood'. The shift in Welsh pronunciation during the Dark Ages meant that 'w' became a 'gu' or 'gw' sound. Wenet (Venedotia in Latin) became Gwynedd (in North Wales). The British tribe called the Votodini (Wotodin) by the Romans became Guotodin and then Gododdin. The problem was that a forest was already called a coed in Brythonic and Gaulish before the Romans arrived. From this it could be concluded that such a 'w' to 'gu' or 'ku', or 'gw' or 'kw' shift had occurred twice in Celtic languages, the first shift occurring in pre-history. The first written mention of Celts is by the Greeks, who called them Celtoi. Later they referred to the Celts as Galatians. In both cases a hard 'k' or 'g' followed by an 'l' and a 't' are in the name. So if the original name began with a 'w', where is the evidence? The evidence is in what Germans have always called them: 'Wahl'-ish. Apparently the 't' sound was softened to 'th' and then dropped. So what does all this have to do with Odin? Quite a lot. Imagine how much of a surprise it was to realise that the word for the very same god was used by the German Lombard/Langobardi tribe: Godan. Guodan is again very suggestive of that 'w' to 'gu' shift that is being proposed here. Were the Lombards a mixed Celt/German population? And if so, what was the real meaning of the word? Was it a German word or a Celtic word? What were they describing? A magician, yes? "...Amongst [the Gauls] there are generally three divisions of men especially reverenced, the Bards, the Vates, and the Druids (para pasi d' hōs epipan tria phula tōn [p. 270] timōmenōn diapherontōs esti, bardoi te kai ouateis kai druidai). The word 'ouateis' ('wateis') is most definitely not the Latin word 'vates'. Strabo was writing in Greek, and he used the Celtic words, bards and druids (in Greek spellings, of course), so ouateis is also the Celtic word, and a close cognate to vates in Latin. A vates is a diviner, a type of magician. And as anyone knows who has actually done magic, divination and evocation/invocation are very closely related activities. You cannot successfully divine without summoning. So what does this have to do with Odin? The older form of his name is pronounced Wotan or Wodan. So the Latin vates - noun, masculine - seer, prophet. The cognate in Irish is fāith, where the 'v' became an 'f' as it normally does in Gaelic. The Celtic word is highly likely to havebeen close to the Latin. Pokorny states: Anglo-Saxon - Wōden - (prop. n.masc) is given as a reflex (a cognate) for vates. From Etymonline: god. Old English god, 'supreme being, deity', from proto-Germanic *guthan (cf. Du. 'god', German 'Gott', Old Norse 'guð', Goth 'guþ'), from proto-Indo-European *ghut - 'that which is invoked' (cf. Skt. huta - 'invoked', an epithet of Indra), from the root *gheu(e) - 'to call, invoke'. This seems to be a related word. One has to wonder if Wotan was not a name, but instead a title or job description, 'diviner' and 'magician'. The proposition here is that this is exactly what it was. So how did this become a deity? There is plenty of evidence that it was customary among Indo-Europeans to deify powerful and influential individuals. It's been less than two thousand years since Roman emperors were elevated to the status of gods. And indeed, the Catholic Church's habit of sanctifying (making into saints) their best churchmen is a possible outgrowth of that same custom. A fascinating side of this in India is that a god is called a deva, but a godlike non-deva is an an-sura (asura). 'An-' is a negative prefix used the way we say non- or not-. Sura appears to be a very old name for a god. Whether it is older than dewas (deva), or younger or concurrent is unknown. The name of the non-gods who were gods appears in both Hindu and Norse/Germanic traditions. The Hindu Asura are the same 'tribe' of godlike beings which the Norse call Aesir and the Saxon call Os. The name is apparently quite old, but how old? These Asura appear to be lesser beings, men in fact, who became as gods, and the Hindu stories lend credence to the idea of the Aesir being men who were elevated to godhood. 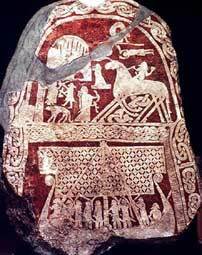 (See Tribal Warfare of the Gods in Scandinavia for a more in-depth examination of Aesir and the Norse gods). The Sámi are the likely source for Germanics learning their magic. As with many Eurasian shamanic drums the Sámi drum, above, shows the same division of the worlds that the Norse talk about: a higher world or worlds, a lower world or worlds, and a middle world? Odin is given in many royal genealogies, a direct expression of descent from the god. And let there be no mistake in this, because the line of descent is often through Balday as Odin's son (ASC), a name known in Norse tales as the god Baldur/Baldr, a son of Odin [known in the royal descent of the Angles as Bældæg or Baeldaeg - see his entry in the lists via the links in the sidebar]. The German tribes were at one time restricted to what is now Denmark (and even most of that may have been conquered by Celts at one point), and maybe a small area farther to the north of that, on the Jutland peninsula, plus southern Sweden, and a small area of the southern tip of Norway. They would have encountered various Finnish/Kvennish tribes, Sámi, etc to their north, and Celts to their south. While tribal era Germanic religion has its source in all three of the options listed above, The third of them is favoured here as the source of Sei∂r because of the 'unmanly' aspect of sei∂r. To the north and north-east of the Indo-Europeans, and extending far into Siberia, there existed a broad band of many peoples who practiced shamanic magic. That magic was often gender-bending, ie. men acting as women and vice-versa. 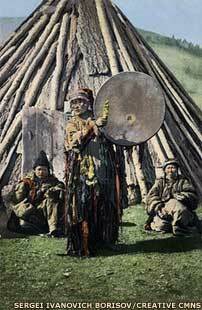 The Finnish tribes were at the far western edge of that spectrum of shamanic practice. And the Finns were famous among the Norse as magicians. "It will be sufficient to name the most powerful of them - the Arii, Helvecones, Manimi, Elysii, and Naharvali. In the country of the latter is a grove, consecrated to religious rites of great antiquity. A priest presides over them, dressed in woman's apparel..."
Strabo (Book VII, Chapter II) describes German women killing captives and divining from the blood, and Julius Caesar (Chapter 50) their dependence on divining before battle. There would be great benefits in the form of influence and power for any man who adopted the female role of magician; and from Tacitus we have testimony that such did occur. The theory being put forward here is that, at some point in the pre-history of Scandinavia, there was at least one period in which a priesthood took social control of the Germans there (effectively kings, whatever they were actually called). If you read the cosmology of Siberian tribal people (the last survivors in the practice of Eurasian traditions), it shows startling similarities to the cosmology recorded in the Eddur. Priests tend to talk shop with each other. And the German priests evidently picked up techniques and cosmology from non-Indo-Europeans, probably the Kvens/Finns. Whoever was the Wotan (the magician-priest, a title not a name) most likely used his skills to assist his tribe(s), converting a basic 'hit enemy over head' group into a craftier, better motivated culture, with the priests sending the armies into battle after sacrifice and the divination of success. The few descriptions of Wotan in the Eddur seem to fit better as Asian shamanism than Indo-European. 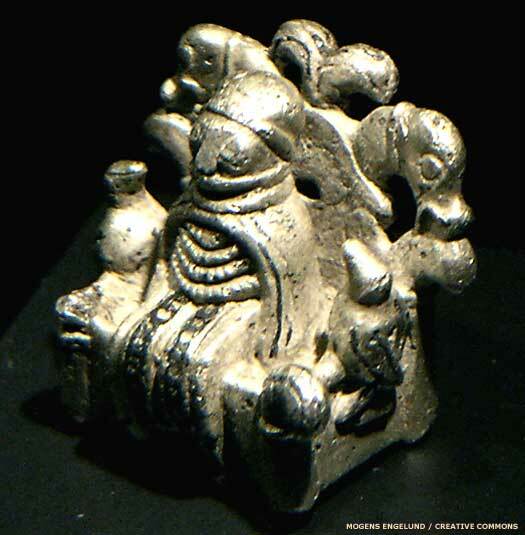 To muddy the gender issue even more, a small silver figure dated to around AD 900 was found in Lejre in Denmark in 2009. It showed a seated Odin, identified by his two ravens and two wolves, and the figure is dressed in women's clothes. 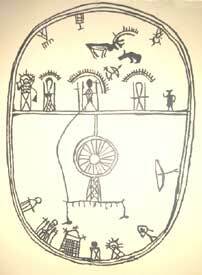 Male shamans in Siberia were reported by M A Czaplicka as wearing a pair of circles on their shirts, to represent breasts. Wotan appears to have been nothing more than a deified shaman, a magician and diviner. In ancient India the alternative name for a deity (a deva, from proto-Indo-European deiwos) was sura. The word means shining or blazing. A second type of god, however, was the ansura or asura. These were 'not-shining' gods. The name is used by several Indo-European peoples, including the German tribes, who shortened the word to Os or As (Old Norse Aesir). Wotan is the Norse chief of the 'not-shining' an-sura. Here's that name. Root / lemma: sā́uel-, sāu̯ol-, suu̯él-, su̯el-, sūl-, (*seĝhuel-): 'sun' derived from a compound of Root / lemma: se- : 'reflexive pronoun' + Root / lemma: ĝhel-1 (and ghel-ö), also as i-, u- or n-stem; ĝhelǝ- : ĝhlē-, ĝhlō- : ĝhlǝ- (*ĝhwel-): 'to shine; green, gold, blue, *sun'. Note: next to which su̯en-, sun-, thus of old l/n-stem; su̯el- 'smolder, burn' is probably identical with it. gr. Kret. (*seĝhuel-) ἀβέλιος Hes. (i.e. ἀ̄Fελιος), gr. hom. (*heuu̯eli-os) ἠέλιος, att. (zero grade) ἥλιος, dor. (*heu̯eli-os) ἀέλιος, ἅ̄λιος [common gr. -kw- > -p-, -gw- > -b- phonetic mutation] : Old Indian ved. (*suu̯el) súvar, Gujarati surdj 'sun' : (*seĝhuel-) got. sugil, ags. sygel, sigel from proto germ. *sugila-, as.swigli 'bright, radiating' from *swegila-, ags. sweg(e)l n. 'sky, heaven, sun', swegle 'bright, radiating'. Maybe Afghan lmar, Waziri lmer, myer 'sun' from Old Indian svárṇara- m. 'bright space, ether'; Armenian arew, aregak, arev, Singhalese ira 'sun'.